With the keyring on the sheath it's easy to clip in just about any out of the way place. It's serrated edge is sharp and stays that way, If you like a small fixed blade knife that can handle most any chore a standard folder could handle and is easy to tuck out of the way, this is the knife for you. I keep mine clipped to a zipper of my vest, and down in a pocket, where it's easy and fast to hand. My wife has one clipped to her key ring, and my son in law has one clipped to his boot top... A friend uses his as his "Mushrooming" knife. It's the one he always has when he's hunting and cutting morel mushrooms... And, at under 20 bucks, it's hard to beat. This little guy is fantastic! Strong and sharp as Cold Steel promises! It really is tiny, dont expect a boot knife... more like a cute little key chain item. The rubber handle is perfect to grip, and the ez-lock sheath holds it in securely. The best part about this is the weight, it's like a feather; making it a great piece to put on your keys, or around your neck. Smaller than I thought it was going to be, a tremendous little cutting tool. 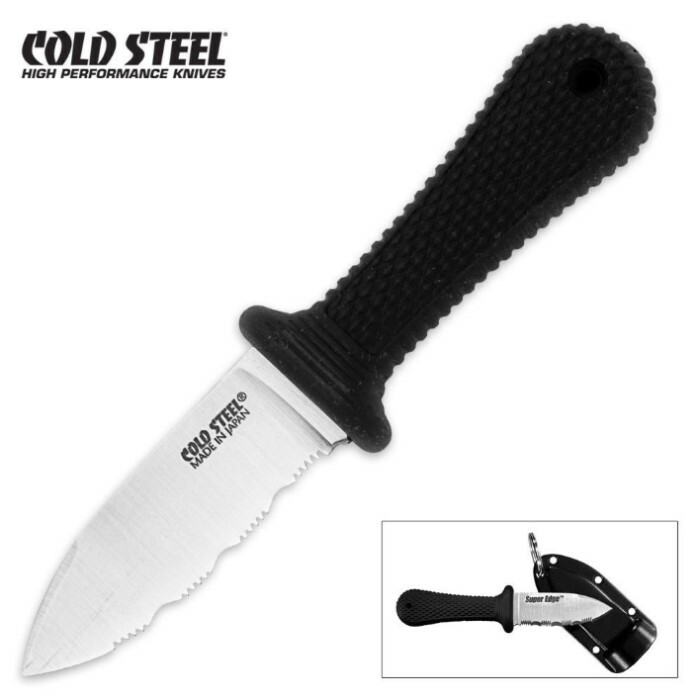 As is typical of Cold Steel, it is made very solidly, and it now goes with me wherever I go.